Over the past week, we have seen photographs from my grand aunt Detty’s (Benita McGinnis) scrapbook of her life’s memories. 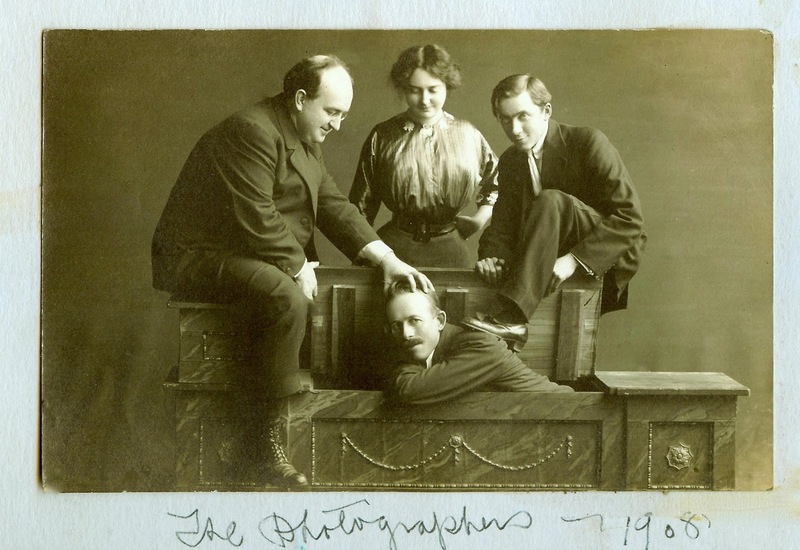 Today, we get to take a peek at some of the people who may – we are surmising here – may have taken some of the pictures from the School of the Art Institute of Chicago. The box looks like a prop that might have been part of a magician’s act. Why are the two men pushing the third man into the box? Could it have been just for the sake of artistic composition? The man on the left bears some resemblance to the professor in the photograph we saw last week, surrounded, you may recall, by the students of the Girls’ Life Class as they boldly raised their wine glasses on some special occasion. Who were these four people? Were they in fact photographers, art students, or simply practical jokers? One can always hope that someone will recognize them and give them their due.